There’s only one day until the New Year’s eve and we’re eager to jump right in and embrace the new adventures that 2016 has prepared for us. Thus, starting a new year’s resolutions list would be a wonderful way to welcome the upcoming year with open arms. We’ve seen many resolutions list out there, but this one can best describe the hopes and dreams of the common creative. No matter if you’re a web developer, programmer, designer or any other type of creative, success probably means more to you than just winning another round. In the world of design, success means feeling joy and accomplishment while giving your best in your job and doing the things you love. 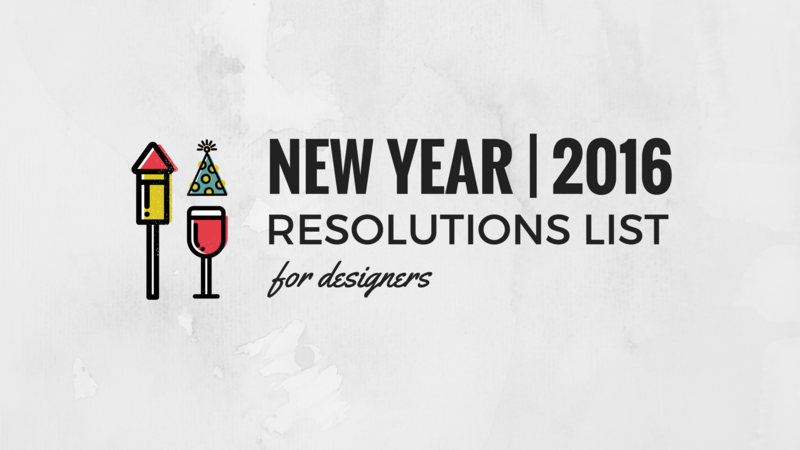 This is why, here at SpyreStudios, we created our own list of new year resolutions which are focused on helping designers and creative individuals get on the railroad of success during the new year. Truth is, if you don’t put the word out there yourself, you’ll hardly be noticed by influencers in your creative niche. Is there a personal project you haven’t really showed to anyone, but you’re absolutely proud of? Is your fear of rejection holding you back from reaching out to big companies in your industry? Doesn’t matter if you have a striking portfolio or not. There’s always something you can brag about, be it volunteer work, personal projects or simply good ideas. Show off your brilliance and talks about your work with passion. Who knows, this might be just what the fortunate needed to spin the wheel and get you on the road to success. Getting a deeper understanding of your medium will help you accomplish lots of success in your design projects. Learning your niche well doesn’t mean you have to bury yourself with books and spend a fortune on online courses. If you want to be good at what you do, first, you need to know your design tools. Most designers are used to working with the world’s most popular design software Adobe Photoshop, yet, there are plenty more you can try. Graphic design tools, such as Canva, CorelDraw and ArtRage are often overpassed by creatives for a number of reasons. The lack of time and interest in the new designing technology can play a bad role in your professional success, but that’s not what’s important. Having an extra skill in your resume will definitely boost your job application and it can be a great way to develop your knowledge in a certain niche. Graphic design is an ever-changing niche where art and style constantly develop by following the world trends. In order to be successful in your design niche, you need to follow those trends while adding a personal touch of style to each of your designs. Yet, there’s one more way to stay ahead of your competition and become a famous designer in your industry and it can be accomplished through experimenting. What makes an artist irreplaceable is his way of visualising ideas. Your quirkiness and personal style are the qualities that build you as a great designer. This is why you need to follow your instinct and experiment more with graphic design, whenever possible. It’s easy to say it and even easier to do it! When was the last time you let a typo slip in and ruin your design or actually gathered the courage to say “no” to a client? These otherwise small issues often manage to make designers feel miserable. Yet, there are plenty of ways to get pass them and even learn a lesson or two on the way. If you haven’t heard of Grammarly, now’s the time to do so. This tiny tool will save you lots of headaches when finalizing your final graphics design project. Copy-paste your text in the site or simply use the automated spell checker by installing the app in your browser and forget about your troubles. And when it comes to deciding on whether or not you’ll decline or accept a design job, there’s no better way to do it than make a short pros and cons list. Is the job paid well? What benefits will you get from it? Does it offer exposure or will this volunteer task make someone genuinely happy? If you feel something’s not right, get so good night rest before making your final decision. Finally, live to the fullest, because being a designer takes not just skills and inspiration, but a true love for design and a good dose of positivity. A happy designer is a successful designer and if taking a one-month vacation away from your work or getting friends over for a game night is what gets you going, then do it! Treat yourself and have respect for your time and efforts, and you’ll be able to consider 2016 a success. We wish you a year full of joy and great projects to come!